The United States Supreme Court has declared in three separate cases that the Guantanamo detainees are entitled to trial, and that their fundamental rights have been compromised. These rights cover U.S. citizens and non-citizens. Furthermore, the Court has ruled that, even if Guantanamo Bay were to be understood as foreign soil, all rights would still apply. 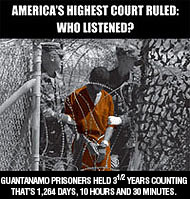 On June 29, 2006, the Supreme Court ruled (read supreme court ruling) that the Bush administration's use of military tribunals to try detainees at GuantanamoBay was illegal. In a 5-3 decision, the Court argued that the commissions set up in GuantanamoBay violated both the Geneva Conventions and the Uniform Code of Military Justice. The Court also ruled that the federal government does not have the authority to establish tribunals which are not sanctioned by the "laws of war." The Guantanamo prisoners have been strongly supported, not only in the media [link], but by important neutral groups and individuals who have filed arguments (“amicus briefs”) with the federal courts and the U.S. Supreme Court. Amicus Curiae Brief filed by Helen Duffy of The International Centre for the Legal Protection of Human Rights (INTERIGHTS) and William J. Aceves, Professor of Law at California Western School of Law, on behalf of the Kuwaiti Detainees. The brief explains the international law regime and articulates the human rights that should be accorded the Detainees, even in times of conflict.